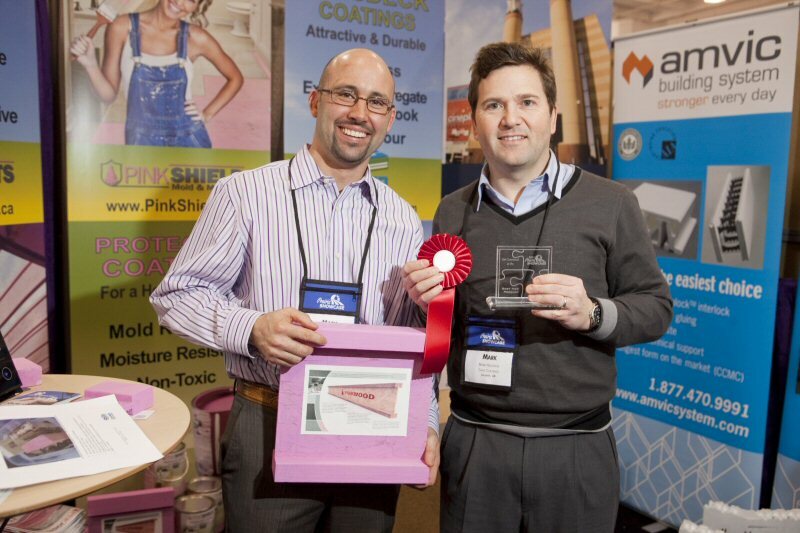 It was announced today that PinkWood Ltd. was awarded the "Best New Building Product - Canadian" for their PinkJoist™ product line at the Western Retail Lumber Association (WRLA) 2011 Prairie Showcase in Saskatoon last week. The WRLA Prairie Showcase Buying Show & Convention is one of the largest shows of its kind in Canada, with 600 booths and over 250 exhibiting companies representing the construction industry across western Canada. PinkWood Ltd's PinkJoists™ are covered with a unique coating that contains a water repellent, fire retardant, anti-mold agents and anti-fungal agents. The highly visible Pink colour is a result of the companies ongoing sponsorship agreement with the Canadian Breast Cancer Foundation in support of their research to find a cure for breast cancer. The colour allows home owners to not only see that their house is protected but also see that they are helping support a great cause. "We are very proud to be recognized as having the best new Canadian building product for 2011," said Richard Dettbarn, President and CEO, PinkWood. "It shows that the construction industry as a whole is excited to have healthier and safer building material options for their homes and that it is possible for social responsibility to be a central philosophy for a company in any industry." PinkWood Ltd. is a Calgary based company and is presently distributing PinkJoists™ through lumber retailers and truss manufacturers throughout Western Canada. PinkWood Ltd. is a specialty building material producer for the home construction industry that provides unique construction products coated with a non-toxic water-based coating that resists the growth of mold and rot fungus while providing added fire protection to homes. The company strongly believes in giving back to the community and donates a portion of all sales to the Canadian Breast Cancer Foundation. About this company PinkWood Ltd.